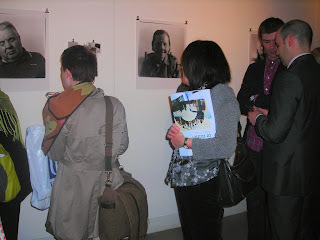 PLACE will host an exhibition by photographer Julia Atkinson as part of Polish Cultural Week 2009. This body of work portrays young Polish architects ‘on the move’ through derelict landscapes within Queen’s Island, captured through the passenger window of a moving car. These professional figures offer a glimpse into the recent Diaspora of Polish architects living and working in Belfast, contributing to the mass regeneration of this city yet who remain mostly unnoticed by Northern Irish communities outside the realm of architecture. 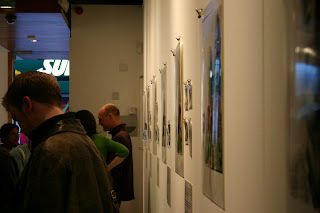 Emphasis is placed upon the architects’ movement and passage, replicating the incidental encounter witnessed in street photography, indicating the subjects’ temporary stay in Belfast. ‘Blueprints: Architects in Transit’ seeks to challenge stereotypical portrayals of migrant workers. Backdrops of the old shipping docks pay homage to the history and the traditional industries of this city however the unexpected presence of the ‘passing’ architects offers a new energy, reflecting the changing face of Belfast. The exhibition launches on Thursday 7th May from 5-7pm, and runs until Saturday 16th May. PLACE and Joan Alexander's Home Front exhibition feature in today's Belfast Telegraph, in an article by arts correspondent Liz Baird. 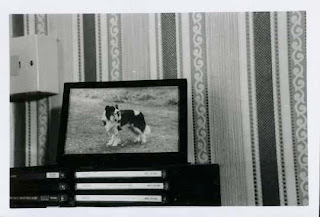 "Each portrait is accompanied by photographs of elements of their home as well as extracts from conversations about what home meant to them. Some are sad, some wistful, some poignant, some resigned but they all provide serious food for thought. There is Miriam who has “no happy memories” or Tony who is resigned to blindness in a strange place, or Evelyn who dwells upon the death of her partner — all sad little snippets from life, all disturbingly real." 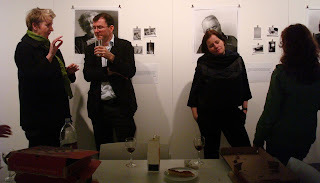 L-R: Ruth Morrow, Chair of PLACE; Hugh Campbell, UCD; Nathalie Weadick, Irish Architecture Foundation; Foreground: Pizza! 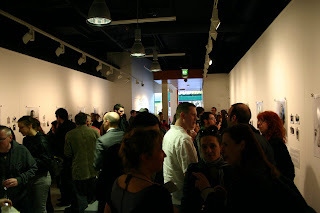 Missed this when it was first posted, but Alan in Belfast has some commentary on the PLACE Lives of Spaces event at the Belfast Film Festival earlier in the month, together with some pictures of our guests happily munching on pizza. "Overall it was a celebration of the communities that constructions support. Not about the pure beauty of the architectural form, but the opportunities and potential unlocked. And it made me think about the parallel tendency in the world of IT architecture to fall back on basic static designs (with lots of rectangular boxes and lines between them to represent the systems and interfaces), forgetting that it’s all about the people using the solutions and the opportunities and potential unlocked." 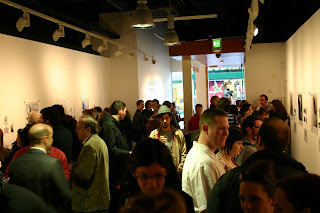 Do keep an eye on Alan's blog - it features musings on all sorts of Belfast cultural topics. As he puts it himself, it's "comment on cinema, books, technology, and the occasional rant about life". In a society where the service sector makes up the vast majority of employment and GDP, what does it mean to be from a post-industrial city? What can regeneration offer a place without taking away what is unique? 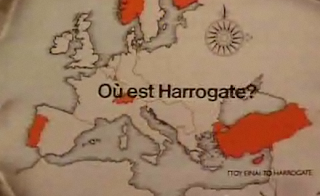 These questions are at the core of John Harris's The North-South Divide, which aired on BBC Four last night. The documentary looks at the ever-present gap - from house prices to education standards to life expectancy - between England's North and South. Harris visits towns like Hull, ravaged by the decline of their traditional industries and seeking new roads to prosperity, and towns like Cambourne, established purely to house commuting service sector and "knowledge economy" workers. The travelogue provides telling glimpses of some typical English landscapes; from quaint villages to empty ports and collapsing warehouses, to the ubiquitous retail parks on the edges of towns. The North-South Divide is available on the BBC iPlayer until Thursday 16th April. 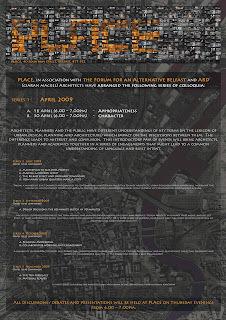 PLACE is proud to present a series of colloquia in association with the Forum for an Alternative Belfast and ARD Ciaran Mackel Architects, taking place from April - November 2009. The series kicks off this month with discussions around "key terms in the lexicon of urban design, planning and architecture", beginning on Thursday 16th April with Appropriateness. 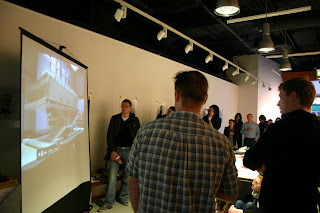 This month's discussions are aimed at architects, planners and academics, but all are welcome! Click the flyer above for more info! 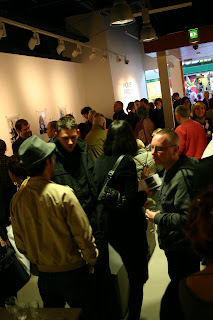 All events hosted at PLACE, 40 Fountain Street, Belfast BT1 5EE (map). 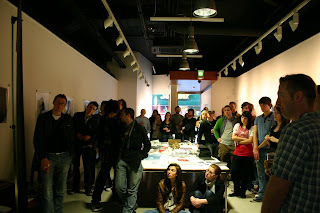 Via BelfastGalleries.com, photos from various galleries in Belfast on last Thursday night's Late Night Art tours. "Design truly has the power to bring people together"
Celebrating their 10th anniversary yesterday, the nonprofit design services firm Architecture for Humanity brings "design, construction and development services where they are most critically needed". 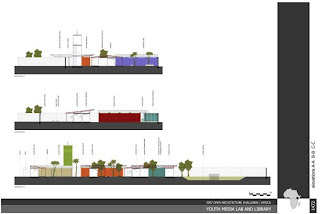 They developed the Open Architecture Network, an open source architecture resource allowing architects, designers, builders and their clients to share architectural plans and drawings, including CAD files. 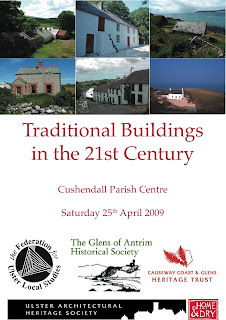 The Federation of Ulster Local Studies, together with the Glens of Antrim Historical Society and the UAHS, present Traditional Buildings in the 21st Century, a one day conference designed for historic building owners, including site visits, taking place on Saturday 25th April 2009. This event is designed for anyone interested in our increasingly rare stock of traditional buildings. It should be of particular relevance to custodians of this fragile resource who are keen to breathe life back into their own building. We will be using the fascinating Glens of Antrim Historical Society Clachan Project to investigate the potential of these clusters of dwellings within the Antrim Coast and Glens Area of Outstanding Natural Beauty. Case studies from the Mourne Heritage Trust’s award-winning Mourne Homesteads Scheme will demonstrate how these buildings can be restored and upgraded to provide comfortable 21st century living accommodation. Places can be booked through the Federation of Ulster Local Studies. 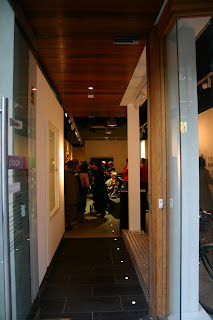 Thanks to everyone who came along to last night's Late Night Art, where we launched Joan Alexander's Home Front, and the first weePLACE exhibition, Fergus Jordan's study of artificial light in the urban landscape. Working with the RSUA Education Committee, PLACE was pleased to convene the first official meeting between students of the University of Ulster and Queen's Schools of Architecture, last Thursday night. The students are going to work together in delivering a project culminating in an exhibition to be displayed in PLACE later in the year. Meanwhile, PLACE was pleased to welcome Nathalie Weadick and Dobrawa Brach-Kaluzna of the Irish Architecture Foundation (visit their excellent website here), along with Hugh Campbell of UCD, to PLACE's event at the Belfast Film Festival last night. 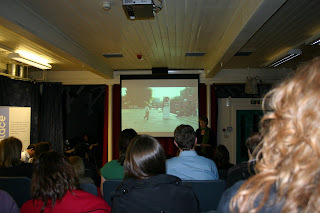 Nathalie and Hugh are curators of The Lives of Spaces, Ireland's entry to the 11th Venice Biennale in 2008. 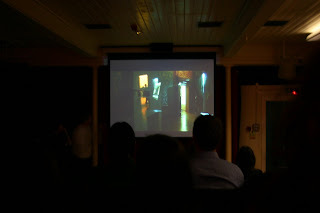 Last night at the Studio Cinema in Belfast's Cathedral Quarter, they discussed the work of a film curator, and the role of film in presenting architecture - with particular reference to their role in leading this project. More info on the project on The Lives of Spaces website. The book to accompany the project is now available in the PLACE Bookshop for £15. 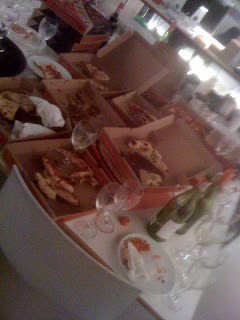 And afterwards it was back to PLACE for pizza! Photos by Amberlea Trainor and Mark Hackett.